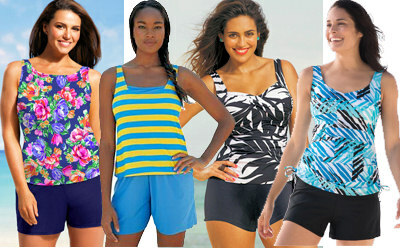 A Plus Size Jogger Swimsuit provides the look of a tank swimsuit with jogging shorts. This is a great sporty look that provides extra coverage! A traditional jogger swimsuit is a one-piece with the attached shorts. These are not very plentiful, but you can achieve the same look by layering a pair of swim shorts over a tank swimsuit or with a Tankini that has shorts (sometimes called a shortini). 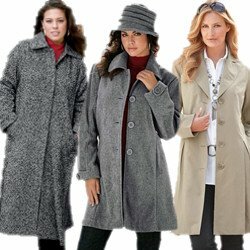 This is a very flattering style for most body types. This is a very traditional, sporty jogger suit. It is one-piece and comes in 4 colors. 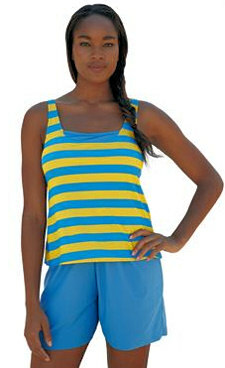 Athletic inspired attire (including swimwear) is very popular for this summer. This style is much younger and fresher. It looks more like a cute summer shorts outfit than a swimsuit! This is also a one-piece suit. I love everything about this shortini - it is modest yest very fashionable. The floral print, in the right colors is SO in fashion this summer! I also love that althought it is sold as a set, you can get the top and bottom in different sizes! If you are looking for something unique, this may fit the bill. It is a 2-piece shortini with boy shorts. What makes this unique is the vintage inspired top - in a black and white print that is so in fashion - it is a modern twist on an old look. This is a great all black 2 piece shortini with a pop of color. This would be a very flattering suit - the color accent will draw the eye to the smallest part of most women's bodies. This is a two-piece tankini that gives you the same silhouette and look as a jogger suit.